Saving our skin, celebrity life tips, teens and Facebook, Elvis Dogs and the Hyperloop -- that's what caught my attention this week. 1. The temps are dropping but it's still summer and, most importantly, it's still sunny. That means you might not feel those rays, but they're still burning your skin. Watch this video from our good friend Dr. Mike Evans on why we need to protect our skin more than ever -- and show it to your kids if they are old enough to understand. He makes it simple and direct. Of particular note is the fact that melanoma is the second highest cause of death in young adults ages 25-29, and it's the most common cancer in that same age group. It's on the rise. 2. Here's another video of interest and one to share with kids who are old enough. It's a great message and, shockingly, it's delivered by Chris Kutcher (better known as Ashton) at the Teen Choice Awards last Monday Night. Remember, the medium is not the message, so don't focus on who it is but rather what he says. I also think the background on the stage is pretty cool. 3. If you have a teenager at home, they might post the above video on Facebook to share with their friends. But maybe not. This 13-year-old blogger who wrote a post titled 'I'm 13 and None of My Friends Use Facebook' certainly would not. She's busy on every other social network out there because her parents aren't on them. Meanwhile, her parents think they are hip to social media because they know how to upload their perfect family photos on Facebook. It's a very interesting article written from a teen's perspective, but very important for parents to read if they want to understand where their kids are online. Teens are awesome. 4. Whether you have a teen or a toddler, what child would not love this lunch? It's called the Elvis Dog and I found it on an amazing blog called Lunch Box Blues. I love that it's written by a foodie dad who prepares meals for his son every day (many of which have bacon in them--his sons' fave food). 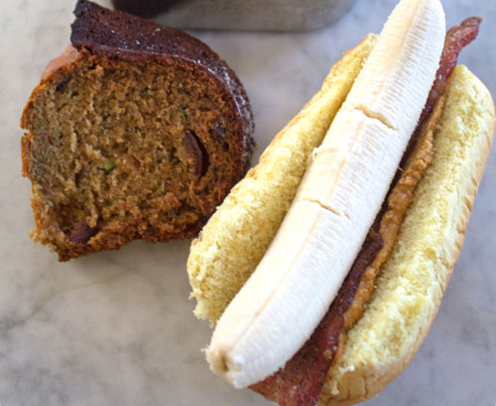 There's nothing like peanut butter, banana and bacon to make a kid's day. You'll find more inspiring ideas for lunches if you keep looking. It's not all Elvis, I promise. 5. Speaking of awesome, the internet has been on fire over Elon Musk's proposal for a Hyperloop in California. Elon Musk is the co-founder of PayPal, electric luxury carmaker Tesla Motors Inc., and the rocket-building company SpaceX. Now he is proposing a high-speed, solar-powered city-to-city transport system that, in his own words, is 'a cross between a concord, a rail gun and an air hockey table.' It's actually made up of tubes. Watch the video for a visual, which makes it easier to grasp.